Tiberius: 14 A.D. to 37 A.D.
By the time Augustus passes away, only a few Julian-Claudian heirs remain to succeed to the throne. Whether by natural attrition or by the hand of Livia, only her son Tiberius remains as the mature and experienced candidate to be Caesar. 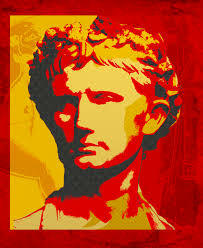 Having shunned public life for many years, Tiberius became the second emperor of the Roman world. Sadly, his reputation as grouchy and mean-spirited tarnishes his legacy. Competent and hard-working, he proved to be an able and accomplished administrator of the vast enterprise known as the Roman Empire. But his relationship with the senate was difficult due to his prickly personality. The people of Rome disliked him even more. Lacking the charm and charisma of Augustus, he eventually exiled himself to Capri, off the coast of Italy, and spent the last 11 years of his reign in seclusion. While Tiberius was at Capri, the infamous Sejanus, Praetorian Prefect, attempted to mount a coup against him that almost succeeded in removing him from power. As Augustus before him, Tiberius lived a long life, passing away in the year 37 A.D. As a dying act of vengeance against the Roman people, he designated Caligula as his heir.